Teenagers! Can it get any Worse? Teenagers! I have three of them! For the most part, it's okay, but there are times when even the best translator in the world could not improve the communication problems. If you have them, teenagers I mean, then you know what I am talking about. HA! I LOVE THAT ONE! I THINK MR. BRAULT WROTE THAT ONE ABOUT MY SONS! NO WONDER I AM FEELING OLD! HA! I KNOW THATS RIGHT! When I was a boy of fourteen, my father was so ignorant I could hardly stand to have the old man around. But when I got to be twenty-one, I was astonished at how much he had learned in seven years. ~Mark Twain. But, they are only children for a while, so I try to wrap myself around them as much as possible. In 2004, country singer Billy Dean released a song that he co-wrote with Richie McDonald. The song was entitled, Let Them Be Little. AND I LOVE YOU SO, SO, SO MUCH, MARINA! Tomorrow I will climb aboard that plane once again and head back home. I can't wait to get there. I miss the kids. Elijah's voice stripped out on him just prior to his play tonight. I wish I had been there to rally around him. I hope he forgives me. I'm not really thrilled about flying. This is my first time. Tomorrow I will be 38,000 feet in the air. The alternative was driving 28 hours. NOT! The lights of Las Vegas are truly amazing. The Rio is a great place to stay. They say what happens in Vegas stays in Vegas. This time, what happened in Vegas is not going to stay in Vegas because I came here to help my new business grow and I believe it is going to. I cannot wait for this time next year to see just how much it will have grown. God blessed the Moringa tree. I love helping people. I am truly happy to be doing that. Today I am leaving for Las Vegas. I can't wait to get there. The best part of the trip will be the trip back home, because I know that when I return my new business is going to explode and I am so ready for that to happen! A great radio voice has been silenced and it is a sad day for all of us who knew and loved him. 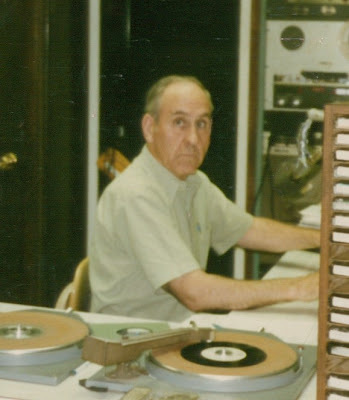 Eddie Neal accepted the call to preach several years before he became a radio announcer. To support his ministry, and his family, he got a job at grocery store. When an opening came up at at the new WFLW-AM in his hometown of Monticello, Kentucky, Eddie got the won. That was in July of 1962, and so he spent the next 47 years 'on the air' entertaing his listeners and keeping them informed as to the latest news and events. Along the way, Eddie Neal became a legend on the radio, and a very well respected preacher of the Gospel. He preached for several years on my radio station and that is where I got to know him. I was young and working weekends when I first met Eddie Neal. He always came into the radio station wearing a smile, and a warm handshake was never far behind. He always asked how my family was doing. As I grew older, it didn't take long for me to realize how popular he was, both as a preacher and as a disc jockey. He was loved by everyone and his listeners were very loyal to him. If my grandmother Boles were alive today, she would quickly tell you that she was one of his faithful listeners. According to her, whatever Eddie Neal said on the radio was the gospel! She always spoke of her favorite disc jockey with passion. To her, his words were gold. If his weather forecast differed from another, he was right and they were wrong. And, there was no way you were going to change her mind. Eddie Neal was 'on the air' longer than any other disc jockey in this area, and while his great and unique voice has been silenced, his memory will live on. "Remember friends, as you pass by, as you are now, so once was I. As I am now, you soon shall be. Prepare for death, and follow me". I love learning about my ancestors, so I was thrilled the other day when my friend - and cousin - Tommy Bertram gave me this newspaper clipping from 1909. It was the phone call that every parent fears and it happened to me last Friday night. The boys were at friends' homes having sleepovers and I ended up in front of the computer in my office when suddenly my cell phone rang. "Elijah has been in a four-wheeler accident. He ran into a moving vehicle." Thankfully, I was just a couple of miles away. When I arrived at the scene, Elijah was laying on his back in a field across from his friends' home. He had just gotten on the four-wheeler and made the mistake of going out into the road to turn around. It was just below a blind hill and he did not see the car coming. After striking the car, the four-wheeler slammed into a bank on the other side of the road. Elijah was ejected and flew 10 to 15 feet into the air before landing in that field. For me, it was a double nightmare. As I knelt beside Elijah, my mind instantly wandered back to May 7, 1981. It was on that morning, 28 years ago, that my dad and my older brother and I found my brother, Ronnie, dead from a car wreck. It was around 5:00 a.m. Dad had gone to work and found Ronnie's car on its top just five-tenths of a mile from our home. It was foggy. He felt inside the car but Ronnie wasn't there. He had no flashlight, so he scrambled back to our home and awoke us. I have never forgotten the sound of him pounding on the front door and hearing him shout out the horrific news that morning. We hurriedly drove back to the scene and by that time, the fog had lifted and daylight had arrived. We found Ronnie laying some 40 yards from where his car had landed. The healing part of that tragedy was long and slow for my family. It did not help that I had to drive past that field a few times a day, always looking there - at the spot where we found him. We moved from that house about nine years later and that helped. I guess over the years I was finally able to find a place to put that memory, although I can't help but recall it from time to time. For me, last Friday night was one of those times because you see the field where Elijah lay was the same field where we found my brother dead 28 years ago. Elijah lay less than 50 feet from the spot where my brother lay dead. I can't even begin to describe the flood of emotions that came upon me. It was the nightmare of all nightmares and I am still shaking from it. I just praise the Lord that Elijah is alive. Where we live, there is no road and no neighbors. I think Eliah did what he did because he is not use to having to deal with vehicles passing in front of our home. At the hospital, for over three hours, Elijah lay on that straight board with the neck and head braces on and I was given another reminder as to just how precious life is. It was the same reminder I received 28 years ago...not to take life for granted and to live every moment, every hour, every day to the fullest, and to love, and to hopefully be loved in return.